This is a really solid dual-sport and if I lived in San Francisco or some other big city I would probably get one of these instead of a street bike. I really like how you aren't limited to below 50mph like some of the smaller bikes, plus the stock suspension and stock tires are pretty darn good right out of the box. This would be the ultimate post-apocalyptic hooligan bike, or just your everyday commuter as well. A bulletproof, fun, and approachable bike, the DRZ-400SM is the epitome of the “Jack of all trades”, where it does all things well but no things exceptionally well. Should that deter you? Absolutely not. The DRZ is an example of a timeless and well-considered design that exceeds owners expectations and sets the standard for its class. For new and experienced riders alike, Suzuki’s DRZ-400SM is the go-to recommendation whenever someone wants a reliable, no-nonsense, easy riding SuperMoto that is as capable off-road as it is on. Considering this Suzuki has more or less defined its class, it should come as no surprise that we wholeheartedly recommend it. To me, a sure sign of quality and desirability is found in motorcycle models that change very little over time in production. That’s the DRZ400. The specs really haven’t changed since the bike appeared on the scene back in 2001. This was the S model which was and still is primarily aimed at being stronger off road rather than on road. Riders fell in love with them right away for good reason and Suzuki did well to grow that platform into the SM model- specifically to appeal to those who want better street capability than the S model could provide. It’s true. You can search high and low, but really there’s nobody making a ride in the 400cc class with the reliability, versatility, relatively low weight, low cost to purchase, insure and maintain than Suzuki. Another legendary dual purpose bike virtually unchanged since inception. Everyone knows the awesome reputation of the KLR in the dual purpose world. Costing a couple of hundred dollars less brand new than the DRZ400SM does and having 250 more ccs of engine displacement and a half fairing for better highway riding make the Kawasaki a beast and a force to be reckoned with. Having said that it’s much heavier at 422 lbs. 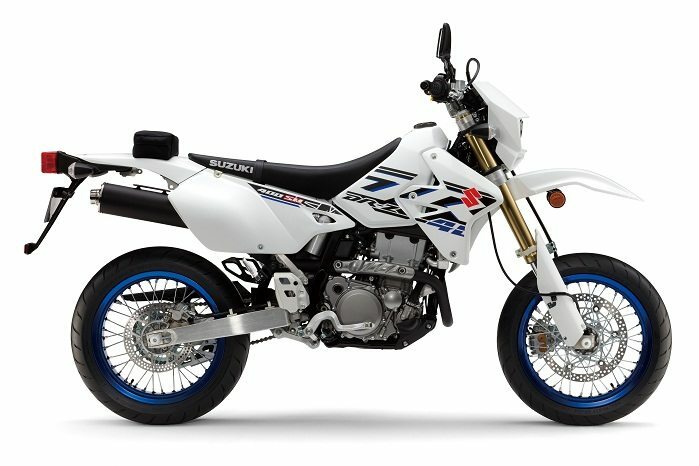 Significantly more than the Suzuki and as such no one is doing the endos and other fun tricks of the SuperMoto world easily done on the DRZ with the KLR. They really are worlds apart when you look at things closely. Also when purchased brand new the KLR only has a 1 year warranty compared to Suzuki’s 5 year. Here’s a newcomer to the scene that is pretty slick. It’s got great new styling and technology on it like fuel injection the DRZ doesn’t along with a 6 speed transmission allowing it to keep up at highway speed. It’s light at 346 lbs wet and costs less at $6299 than the DRZ400SM does by about $1000 leaving you cash to purchase aftermarket supermoto equivalent rims and tires. A real strong contender from Honda! Sadly it’s just a 250cc and compared to the stout 400 of the DRZ the CRF is not going to have the ponies needed for thrills off and on road being that it weighs nearly the same as the Suzuki. These newer higher revving four stroke Honda engines need more frequent valve sets and general maintenance than the DRZ does too. I could name several bikes that are close but no cigar scenarios much like the KLR and CRF, but what’s the point? You’ll either get ones that are really good on power and price but too big and heavy like the KLR, or others just as agile as the DRZ but lacking in the displacement department like the CRF. Nobody is doing it quite as nice as Suzuki. 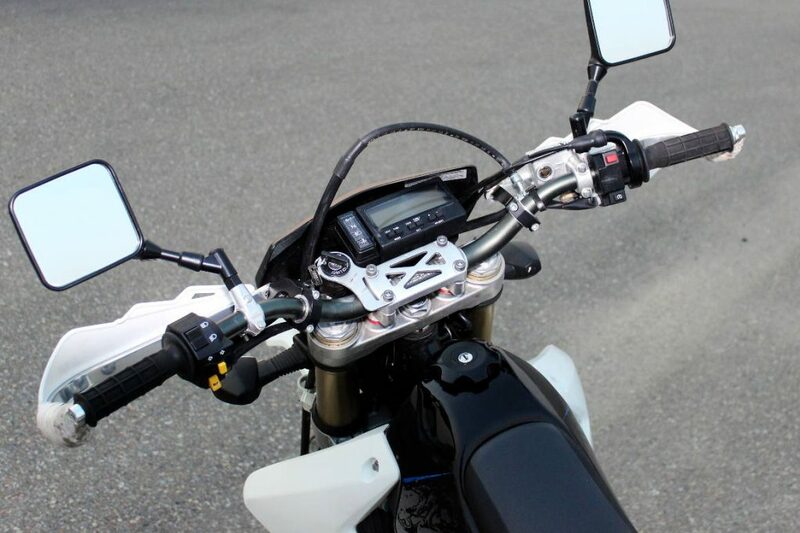 The alternate way to go is to convert an off road bike to a dual sport by adding lights and blinkers to it along with dual sport tires, etc. The problem is that often those transmissions aren’t geared correctly to be really usable on road where you need to reach highway speeds. There are bikes like the Yamaha WR450 that could work and have better horsepower than the DRZ, but the initial cost to purchase it on top of the conversion parts are way higher than just buying the DRZ400SM to begin with. Even if you opt for the most expensive DRZ mods to really bring out the power, you’ll still never reach even the base purchase price of the flashy KTMs, Yamahas and Hondas. Who is the Suzuki DRZ-400SM For? 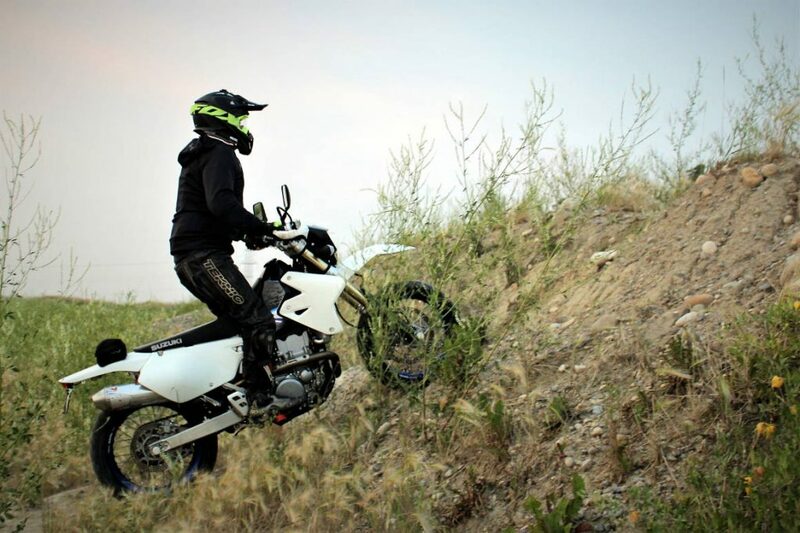 SuperMoto bikes really had their day not many years ago when everyone wanted to own one, but in more recent years the advent of the larger displacement Adventure class has got SM mania fading. It shouldn’t though, because I think it still has a specific role to play for new riders that want to work their way into the bigger, more powerful adventure bikes. Graduated Adventuring let’s call it. To me, 400ccs is the perfect size of engine to learn to ride on for many people. 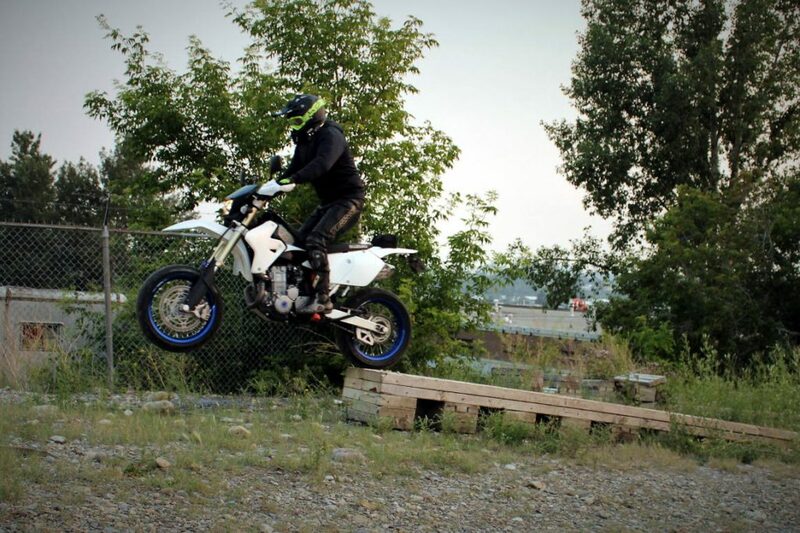 Typical SuperMoto owners are people who refuse to compromise when it comes to riding. They want it all: on road and off road. They often have a background in dirt or motocross riding and because of that have the urge to pull catwalks, wheelies and jump dirt piles on a whim, but still need to be able to ride their bike to work or school. Fun loving and enthusiastic people who think anywhere and anytime is playtime. Whether it’s downtown or down in the bottom of a rock quarry everything is in play for these “hooligans”. SuperMotos are light, agile, easy to handle with good braking and torquey engines. That makes them harder to stall even with sloppy clutch work, more forgiving when it comes to flying into corners too hot or other moments when a new rider can sometimes find the bike driving them instead of vice versa. New riders often drop their bikes at low speed or even just sitting in the driveway… it happens. With many bikes that means having to replace expensive parts, but not with the DRZ400SM. Drop it all you want and most of the time nothing really gets hurt. Occasionally you may have to replace a brake or clutch lever, but that’s not going to break your bank account. New riders aside, I think the SM is a great choice for experienced urban riders that want to scoot around the city with ease through traffic and narrow streets where this bike’s dexterity is such an advantage. The Super Moto’s “flickability” really shines there. There’s also the appeal of easy to do modifications for owners who like to pull wrenches a bit. Many, many aftermarket parts and modifications to make the bike better and more responsive are chronicled in depth all over the internet. Best of all most can be done by owners having only a basic level of mechanical aptitude coupled with equally basic reading skills. You can also just watch a video online most ot the time to see how it’s done if you hate reading. The DRZ400SM is definitely more at home on road since it comes with pure street tires and smaller diameter rims made of smaller and lighter alloy metal not designed to take the pounding of intense off road riding. Having said that it’s quite surprising what those tires can ride on all the same. This is the bike and class that does nothing perfectly, but everything well. If you are the kind of rider that just can’t make a true commitment to any single bike class you should look at the DRZ400SM. I decided to meet up with an owner to make sure I understood who these bikers really are, what they’re about and why they are so high on the DRZ. Jason started his riding career 4 years ago on an Aprilia Tuono thinking it would be a good bike to learn on. It turns out that wasn’t the case and he was a little intimidated by the power to the point that now looking back he sees it actually slowed down his riding education and skill progression. A little over a year ago he crashed his bike, broke most of the bones in his leg and was in the hospital for a few months recovering. Despite this, he didn’t want to stop riding, but wisely decided sport bikes weren’t the way to go for him. 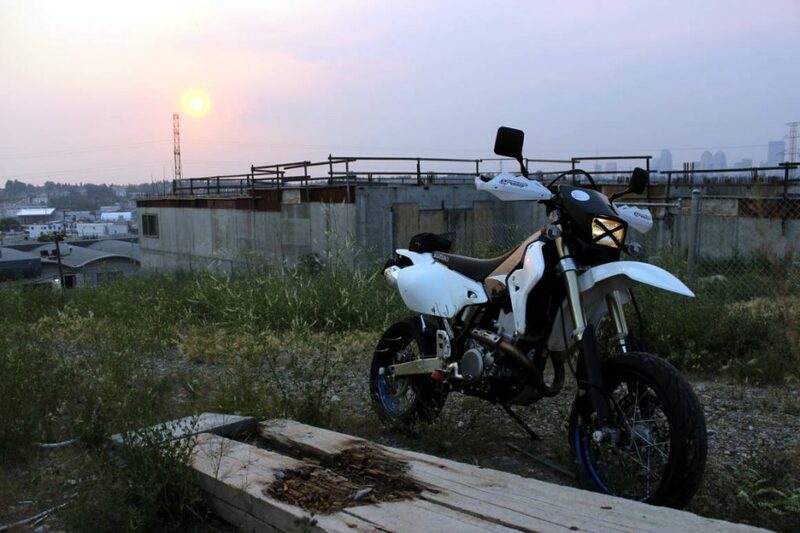 He enjoys using it to commute to school in the city and the flexibility to go places in the industrial park, racing tracks and the outskirts of town to play around with the versatile DRZ over different terrain. While talking about taking his bike where it shouldn’t or isn’t expected to go in the urban jungle a mischievous smile showed up on his face, and I think that’s a common trait with all SuperMoto enthusiasts. He even has a set of studded tires to put on for taking his bike out on the frozen lakes in the winter making it a 4 season motorcycle. 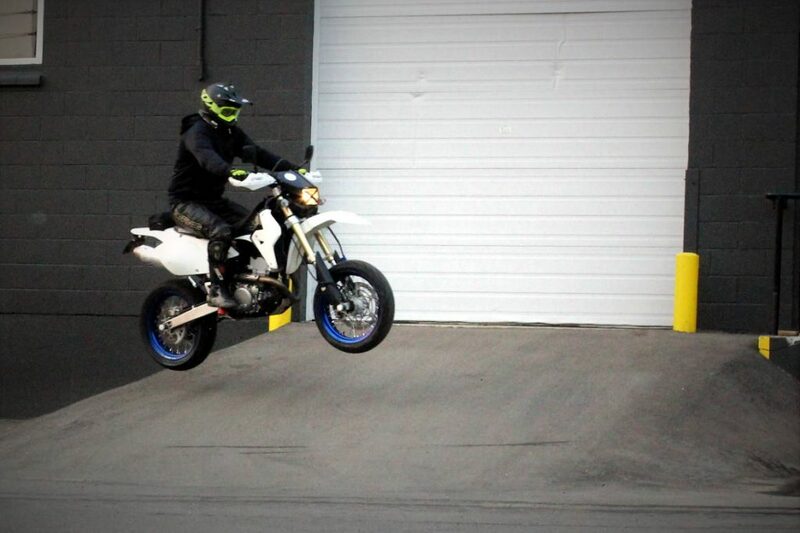 The DRZ opened a whole new world of riding that he wouldn’t have discovered with the sport bike before. Since he feels the DRZ is too heavy to ride in real serious off road terrain, Jason bought a KTM 250 XC and is now working on getting better off road with it. I asked if he planned to sell the DRZ now that the KTM is splitting his riding time and he immediately said there was no way he would let go of it anytime soon. It’s really good fun and he’s just too attached to it. In no way am I knocking Aprilia or Tuonos, I think they are terrific bikes, just not for beginner riders. “Overbiking” yourself is a really bad idea and Jason is fortunate things didn’t end up worse in reality, all things considered. It actually can be used off road quite well, though you are limited by the stock tires and the weight as Jason mentioned. Many riders just buy an off road only set of rims with knobby tires on them to switch to when they plan to get more aggressive with their off the beaten path days. Rims like the ones on the DRZ400S model which are 21 inch front and 18 inch rear are likely the way to go. There’s not too much you can do about the weight, so you won’t be able to keep up with the much lighter dirt and motocross machines on technical single track riding in the deep bush, but you easily can go off roading where many of the much heavier and bulkier Adventure bikes wouldn’t dare. Tinker with your front drive sprocket for extended off road riding. It’s about a 15 minute task, so pretty easy once you know what you’re doing and makes a huge difference. The factory front sprocket is a 15 tooth giving the SM a better top speed for on road, but isn’t as torquey off road. If you put in a 14 tooth sprocket for days you are going to ride off road you’ll thank yourself when you whack open the throttle and find more low end jam. Conversely if you want even more speed for longer trips on road go to a 16 tooth front sprocket and life will be “a highway you want to ride all night long”. Some owners claim the 16 tooth in the front smooths out vibration as well. The DRZ400SM won’t be as capable off road as the DRZ400S model is out of the box, but I still feel it’s smarter to go with it over the S model since you can trick out the SM for less money than vice versa. 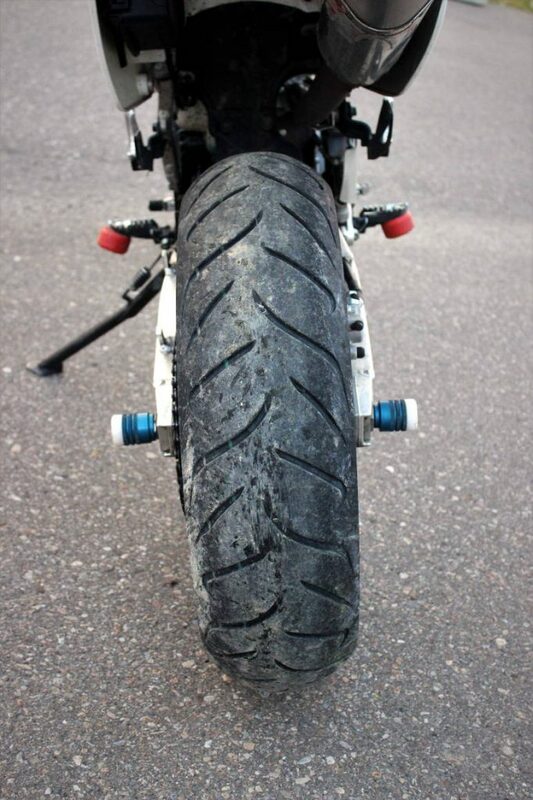 Main reason being the 17 inch supermoto rims on the SM are a lot more expensive to buy for the S model. Add to that the fact the SM comes from factory with inverted forks and better handlebars and the price really goes up for the S to catch up. Inverted forks ensure the SM has less unsprung weight and that makes the bike handle much better not just on road, but in any situation. You’ll find them on any racing or higher speed-capable bike. 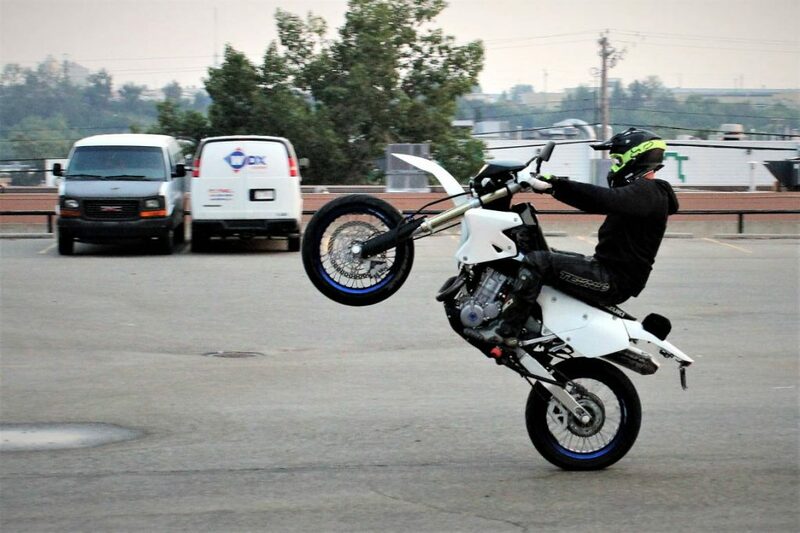 This is the one EVERYONE does to start their life with the DRZ. It improves throttle response and power right away bigtime. In a nutshell, you enlarge the opening on top of the air box to a 3” by 3” size this increases airflow into the carburetor letting the engine “breathe” better. This should be done in conjunction with installing a high flow air filter and the rejetting mod since more airflow alone will lean out the fuel mixture going into your engine a little too much. Doing these mods will negatively affect emissions from your bike and so make sure you aren’t going to get in too much trouble in your particular area before proceeding. There are many different aftermarket jet kits available for the DRZ that work for this mod but most people go with the J-D from what I can tell. The instructions tell you what jet size to use based on the altitude you ride in most commonly and if you have a high flow air filter (the 3×3 mod counts) and aftermarket exhaust. If you start monkeying around with one of the three you have to do the other two pretty soon. These three things (airflow, carb settings and exhaust) are interrelated and I would encourage you to do them all at once to avoid having to adjust things later on to have the bike run right. Many owners skip the rejetting and just replace the stock carb with the Keihin FCR 39 or some other “pumper” type carburetor to get even more performance. This is a good idea if you plan on eventually going to a big bore kit on the engine. More on that ahead. I like a nice growl to my exhaust note regardless of the kind of bike I’m riding. You won’t get a huge amount more horsepower by doing this, but you will get some and every bit counts on the DRZ. Notably, aftermarket systems are also much lighter than the stock one and the weight saving makes the bike feel more powerful even if the horsepower number doesn’t change much. There are also quieting inserts you can put in the mufflers to keep them more civilized if you prefer like on the Pro Circuit T4 system or MRD Z Pro. The most common complaint among long time owners is that there should be more displacement available to make this a bike that will appeal to more experienced riders. When you’re first starting out the power is appropriate but as you get used to it you want more and more. There comes a point when owners have to decide whether to move up to a bigger bike or install a big bore kit on the DRZ. The kit commonly agreed upon as the easiest to install, most reliable and economical available adds 34ccs to the engine. When combined with a set of Hot Cams camshafts, the MRD Z PRO exhaust and the FCR 39 carburetor you can look to get 50 hp out of the DRZ. That’s a big improvement over the stock 37, but unlike just the 3×3 and rejetting will come at a fairly hefty cost when you add it all up. Do this and you may find the “DRZ434SM” is perfect forever. There are other big bore kits that will increase the displacement even more, but they require much more mechanical expertise than the average backyarder usually can manage and there have been reliability issues with them too. Keep it simple and you will still have the same bulletproof DRZ in the end with more power. If Suzuki would just bump the DRZ to a 450cc right from factory this would be the perfect machine in my opinion. I suppose they don’t because it fills a niche they have identified valuable as is… and where’s the fun in just riding a bike as is? What Are Owners Saying About the Suzuki DRZ-400SM? Most of what owners say about this bike is that they love how easy the DRZ is to ride, maintain and work on. The toughness and reliability especially grow their confidence in their ride and encourage them to hone their skills without fear. Other than the ongoing obsession to squeeze more power out of them, there are some other modifications owners like to do to keep their bikes in tip top shape ensuring many years of trouble free riding. They are nearly indestructible when you take the time to do the ones illustrated on websites like ThumperTalk. ThumperTalk is known as the go to resource for off road and dual purpose information. Many of the contributors create postings full of useful tips. Here is a great one about the preventive maintenance for the DRZ I found by poster Erik Marquez. He mentions specifically one must have is replacing the automatic cam chain tensioner (ACCT) with a manual one. The reason being some owners have identified this as a gap in the DRZ’s armour leading in some cases to catastrophic engine damage. On bikes 2003 and newer the ACCT is good enough for stock performance, but since no one leaves their bikes stock it’s best to replace with the manual tensioner on any year model. Cost of the part is about $50 and it’s not difficult to install and set up. If you’re a bigger and/or heavier rider you’re going to need to spend some time setting up the preload on the suspension to suit you better as there is a lot of sag when even an average sized rider sits on this bike. Where is the 6 speed transmission? Only Suzuki knows why this hasn’t been done yet I suppose. It’s interesting that the old DRZ250 had a 6 speed trans, but never the 400. Kickstand switch mod. When taking jumps the kickstand drops a bit on landings and can sometimes trigger a switch that shuts off the engine. Very annoying so this is also one of the first mods owners do by removing the wires from the switch and joining them together permanently. Case savers are needed for both sides of the engine down by the foot pegs because the magnesium ones that come from factory are too thin. The transmission and rear brake levers both have a tendency to rub through the covers as well, so the savers are pretty important. A good skid plate is a must if you ride off road. This first one is representative of the typical SuperMoto rider’s personality. The reviewer is a fun loving individual who calls it like he sees it and unapologetically slices through what naysayers have to say about this class of motorcycle and the DRZ400SM specifically. He is bang on with his assessment of the bike’s history, purpose in life and strong points. He even gets into a couple of the mods showing just how keen owners are to play around in an attempt to make something good even better. In his words it’s the greatest SuperMoto made. Bear in mind that the first 30 seconds or so are so dripping in sarcasm that you may need a mop to clean up after. This one shows an SM model DRZ that has been converted to the S equivalent for those off road riding days. I like the way the creator showcases the many mods and I think it’s helpful to see what I was describing in print, live in the flesh so to speak. Finally, a video showing a heavily modded SM for road racing to contrast with the off road one. The best part is knowing you could have your bike either way without having to break the bank or spend thousands on a second machine. The creator of the video says this will be his first time racing which speaks to the DRZ’s beginner friendly nature again. Summary: The Suzuki DRZ-400SM – Yay, or Nay? How could anyone not be sold on the idea of such a flexible and fun toy to fly around on? The mods are simple and fun to build your confidence in flexing your grease monkey muscle and the bike itself is so versatile that you can ride nearly anywhere. Years ago I owned a DRZ250 and rode it off road only for years very happily. The 250 needed very similar mods to the 400 to get better performance out of it and I was really surprised at what such simple changes made to the personality of the bike. I was tempted many times to move up to the 400, but never did. I got distracted by the side by side craze instead since I have a wife and three kids to roar around the woods with. 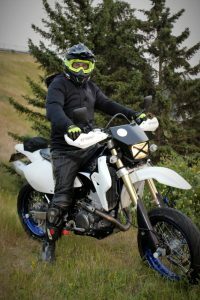 Having said that, after writing this review and watching Jason demonstrate his growing confidence and skill on his DRZ-400SM, I find myself with a new supermoto itch I’ll need to scratch someday.